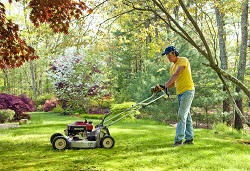 Our team of gardening experts are a real whiz at lawn mowing, so find out how quickly we can finish your lawn maintenance work. Ideal for large commercial organisations, or large homes and with spacious grounds we can deliver an extremely high standard of grass cutting. We always remove grass cuttings ourselves and our state-of-the-art lawn mowers ensure that we do not leave grass cuttings lying all over the field. We provide real quality London lawn mowing services at fantastic prices, and we will even be happy to create designs and patters in your lawn. Our uniformed, professional and experienced lawn mowing team arrive on time and never let our customers down. 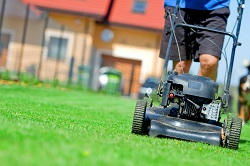 We don’t just cut the grass, we can offer you some great advice with regards to your lawn restoration and repair work to keep your lawns in great condition in the long term. What is great about London Gardeners is that we can deliver this high quality whilst working extremely quickly to minimise the disturbance and noise at your site. Call 020 8434 7256 today to discuss your requirements with our friendly team and we will be delighted to offer you a quotation free of charge for your lawn maintenance. Lawn care is extremely important to use and extremely important to our customers so don’t underestimate the requirement for a really great lawn care and mowing team that knows what they are doing and won’t ruin your beautiful lawns. London Gardeners are ideal for golf courses and other sporting venues creating a range of patterns, designs and specific features that are essential for the garden. We don’t just cater for larger spaces, we are often called on by a number of customers who simply need us to come and cut the nature strip, mow the lawn for their elderly parents or perform a one off grass cutting service for properties that may need a little tender love and care. When it comes to lawn maintenance there really is no finer team so make sure you pick up the phone and call 020 8434 7256 today for a gardening team London that won’t let you down. It really doesn’t matter how big or small your garden is, we’ll be delighted to work our magic on your lawns, not just to cut the grass but to keep them in great condition all year round. For many people lawn mowing is a real chore, but for our reliable gardening team it is a way of life. We love nothing more than powering up the mowers and getting to work on some fantastic sites, meeting great people and building a great rapport with our customer base. We don’t just do the lawn care either, we have years of experience in a wide range of gardening tasks and lawn care so if you have any questions about anything to do with your garden simply ask us and we’ll be delighted to see how we can help you. We believe in great customer service, great quality in our work to provide all of our customers with unbeatable value for money. We guarantee 100% customer satisfaction with our lawn restoration and repair work so for lawn restoration and repair that you can rely on call 020 8434 7256 today. By providing unbeatable value for money we believe that we can grow our business organically on recommendation and reputation and that is exactly what we have been so successful at doing. For experienced, professional and reliable lawn care specialists look no further than our fantastic local company.